The adult songs are the same basic tune as the children's songs, but are sung by an adult and have a fuller orchestration in the accompaniment. All adult titles are $14.95 for book and CD. 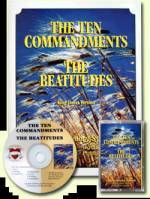 Learn the Ten Commandments word for word and sing the Beatitudes. The adult songs are the same basic tune as the children's songs, but are sung by an adult and have a fuller orchestration in the accompaniment. 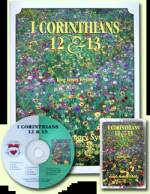 Learn chapters 12 and 13 from 1 Corinthians word for word. Teen & Adult version. 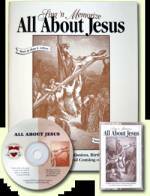 KJV The adult songs are the same basic tune as the children's songs, but are sung by an adult and have a fuller orchestration in the accompaniment. 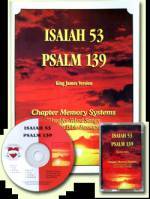 Isaiah 53 and Psalm 139 The adult songs are the same basic tune as the children's songs, but are sung by an adult and have a fuller orchestration in the accompaniment. 21 Majestic scripture songs (20 KJV, 1 RSV) about Jesus' birth, mission, death and second coming. 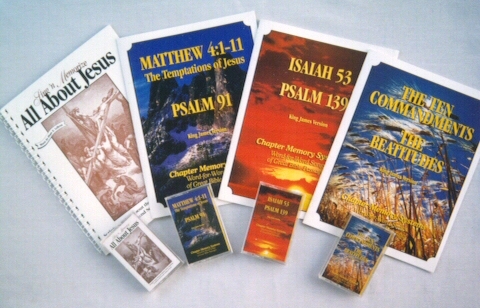 This set contains The Temptations of Jesus (Matthew 4:1-11) and Psalm 91. The adult songs are the same basic tune as the children's songs, but are sung by an adult and have a fuller orchestration in the accompaniment.